I hatelove those articles where you have to guess the source of the quote. See, for example, the “Who Said That?” series at The Riddleblog. The quotes are either tricky, misleading, or – depending who is writing – completely out of left field. The centrality of Christ’s righteousness is imputed to us by faith alone, and this provides the only possible foundation for righteous Christian living. Because the rest of this essay is directed at certain standards of personal conduct in a Christian school, I thought it was important to acknowledge the only possible foundation for this personal conduct. I appreciate the clarity. Detractors might point out he is not clear here on the nature of human faith, but a charitable read notes that he is dealing with the objective nature of justification. (I note, with some glee, a clear forensic priority as well!) There is no sign of the equivocating he was sometimes (justly) accused of. I wish there had been more writing like this after 2002. Of course, that is the point. 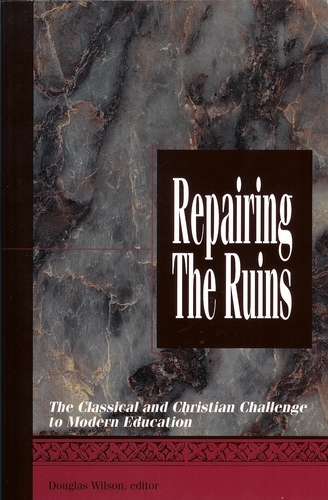 Repairing the Ruins, an edited volume on classical education – not soteriology, was published in 1996. Is it too much to wonder if the writing you see above was the kind that got Wilson invited to Ligonier conferences? And the kind of writing he did later brought controversy? The reader must decide if there was a difference. This entry was posted in posts and tagged justification, soteriology by blund. Bookmark the permalink.